Did you know that the county-run ocean water testing program collects less samples in the winter than the summer? Surfrider chapter volunteers aim to fill the gap and serve as the first response to local water quality threats in our community, and educational initiatives are a key component to creating awareness about these threats. To that end, our Ventura Chapter is launching a Blue Water Task Force (BWTF) with a local high school. The BWTF is the Surfrider Foundation’s volunteer-run, water testing, education and advocacy program. Chapters use this program to alert citizens and officials in their communities about water quality problems and to work toward solutions. BWTFs have demonstrated success by identifying problems with beach and coastal water pollution, raising public awareness of these incidents and working collaboratively with local stakeholders to find and implement pollution solutions. 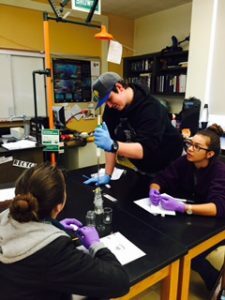 Our program will work directly with local high school students, giving them the opportunity to actively engage in water quality science and local water quality issues. Specifically, students will get hands-on experience collecting and testing water samples from local water sources, sharing their data, and presenting their data at a Surfrider Foundation general meeting Your donation will go directly to the purchase of the necessary testing equipment and laboratory supplies. Click Here to make a tax-deductable donation to help fund the Surfrider water testing program. We need $3,000 to get the program up and running for a year and $10,000 for a full state of the art lab setup. We have secured a $1,000 grant from the California Water Environmental Association (CWEA) to get started, what can you chip in?